Chops of pork - a pretty popular way of cooking meat, so any self-respecting hostess should be able to prepare them. 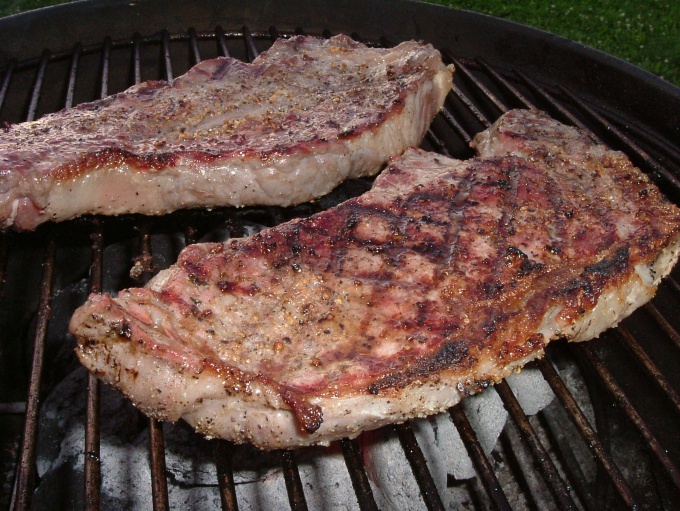 The principle of cooking pork chop is the same, but there are many ways to vary this dish. Below are several options for making pork chops. They get completely different taste. Recipe 1. Pork chops with spices. Rinse pork neck, cut it into small pieces. The thickness of the slices should be about 1 cm. Roll the meat in the spices and salt, carefully drop in plastic film. Leave the meat to rest for about an hour. When it is soaked, beat the egg adding salt and pepper. Dipped the chops in egg, lay them in a hot pan with vegetable oil. Fry the chops from both sides until crispy brown. To serve the dish to the table better with a garnish, you can decorate with greens. Recipe 2. Pork chops under a cheese crust. Rinse and repel pork tenderloin. Then roll the pieces in flour and dip in egg with salt and pepper. Fry chops on both sides in a frying pan with vegetable oil. Then put each steak in a thin slice of cheese, top the cheese spread with mayonnaise. Fry for a further couple of minutes. The finished dish serve with greens and lettuce. Recipe 3. Pork chops in fruit jelly. Rinse the pork, and repel it with a hammer. Fry the chops in vegetable oil on both sides until Golden brown. Next, prepare the jelly. To do this, boil the juice and add the pre-dissolved in water gelatin. Mix thoroughly. Until the jelly has thickened, put the chops in the dish, put on top of them, cornichons and olives for decoration. Pour the fruit jelly. Ready chops in a fruit jelly are served on lettuce leaves. Recipe 4. Pork chops with cider. Fight off the meat and fry it in butter on both sides until soft. Chops are ready place in a deep utensil for baking in the oven. Then fry the finely chopped onion and Apple and add them to the chops. Pour all the cider, add salt and pepper. Bake the chops in the oven for 40 minutes at a moderate temperature. Chops needs to soften. The finished dish pour cream and sprinkle with herbs. Bon appetit!